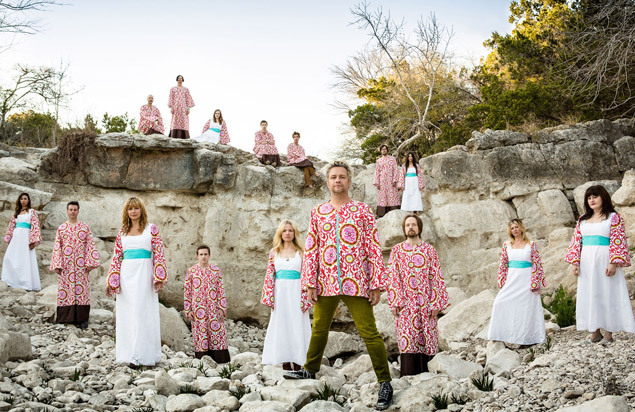 The Polyphonic Spree is spending the fall charging forward by going back in time, minus the DeLorean. The choral rock group from Dallas, Texas, is celebrating the 15th anniversary of their spacey, euphoric debut album, The Beginning Stages of..., by playing the album in its entirety during their current trek across the United States. On Oct. 28, the tour will bring the ensemble to Bethlehem for a headlining concert at Musikfest Cafe. Singer/bandleader Tim DeLaughter, during recent phone interview, called The Beginning Stages of... a "beautiful, somber record." "For this (tour), we decided to pay homage to the exact tempo of the record and marry ourselves to that world for a solid 34 minutes," DeLaughter said. "It's a great exercise." DeLaughter formed The Polyphonic Spree in 2000 following the dissolution of his former band, Tripping Daisy, in 1999. The album -- a blissful combination of sounds that basks in the inspirational illumination of The Beatles, The Beach Boys and Wings, with a splash of Electric Light Orchestra -- was recorded in three days in the fall of 2000, but was not released in the U.S. until 2002. What was initially meant to be a demo, DeLaughter said, quickly morphed into a full-blown album, which thrust The Polyphonic Spree into the spotlight with the help of the single "Light & Day/Reach for the Sun." He spoke fondly of Stages and the band's whirlwind beginning. "It's really charming, the beginning of this band. It's where we were. It's who we were," DeLaughter reflected. "We just went in and made these songs the way we wanted and recorded them the way we wanted to." In the more than a decade since Stages dropped, The Polyphonic Spree has released three additional studio albums -- their most recent being 2013's Yes, It's True -- and a holiday effort (2012's HolidayDream: Sounds of the Holidays Vol. One). The group has appeared on numerous late-night talk shows and, memorably, in a 2004 episode of the former NBC comedy series Scrubs. "Light & Day" was featured in a 2004 joint advertising campaign between Volkswagen and Apple. DeLaughter, in between albums and tours with The Polyphonic Spree, has scored music for the films Thumbsucker and Visioneers. Though it has been three years since their last release, the amount of time between Polyphonic Spree albums is done with purpose, DeLaughter said. "I'm not really one to put out a record every year," he said. "I take my time and hope everything we put out is warranted and I feel really good about it." DeLaughter praised the various musicians who have been members of the Polyphonic Spree family over the last decade-and-a-half. The band has swelled to as much as 27 members, though it's current lineup has slimmed down to a 20-piece. "There are amazing musicians in this band and there always has. The caliber of musicians that have come into the Polyphonic Spree is over the top," he said. "We've been able to do pretty good, considering the size." Despite the various accolades the band has racked up since their formation, DeLaughter said he would like to see The Polyphonic Spree reattain mainstream recognition and success. "I'm always hoping, one day, that ship will come in," he said. However, DeLaughter remains optimistic about the future of The Polyphonic Spree. New songs are in the works, which he said the band will likely start to work on once the anniversary tour wraps up. DeLaughter said he has also been batting around the idea of a film based on the story and evolution of the group. "The road we've had to travel to make it happen, it's really fascinating. The amount of people we've had in this band, it's really not like any other band out there," he said. "It's a very original and unique group. For me, the top of the bucket list right now is to get a film made about this whole, crazy thing." As with anything else related to The Polyphonic Spree, DeLaughter plans on taking his time in seeing it all come to fruition. "It's weird, when you start putting things out there in the universe and put energy into it, things kind of just happen," he said. "I'm looking forward to it."